On the 30th anniversary of its foundation, Datamars releases two reading systems which will change the way UHF technology is used to track textiles. 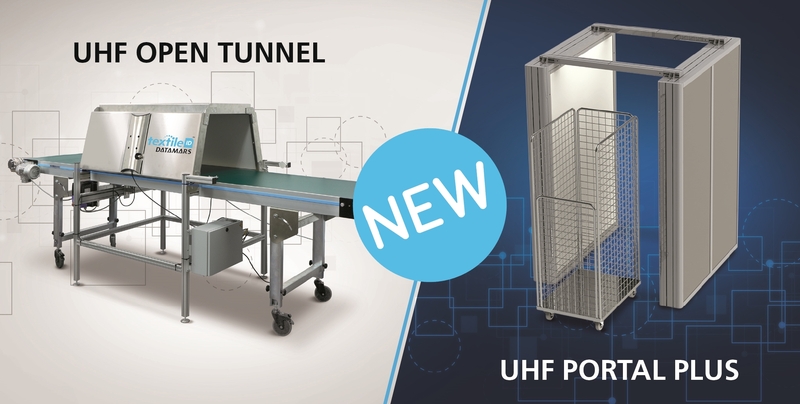 the new UHF OPEN TUNNEL: a plug and play system compatible with virtually any conveyor belt. The tunnel reads stacks of folded textiles with unprecedented accuracy and is totally transparent to laundry operations. the new UHF PORTAL PLUS that represents a new approach to read trolleys ‘on the fly’ with no compromise on reading accuracy or stray reads. While UHF technology allows to read 100s of tag per second and can deal with reading distances up to 8m, the technology is subject to signal reflection. Signal reflection can lead to unwanted tag reading (aka stray reads) which would result in incorrect billing, inventory or delivery. Usually the solution to the stray read problem is to use metal-shielding in order to confine the UHF field inside the reading system (e.g. UHF cabin or UHF closed tunnel). Such systems are highly accurate but tend to slow down laundry flow as they are adding an extra step in the process. The two new In Motion UHF systems overcome this weakness by allowing to read tags while the trolley or the stack of textiles are moving, with no compromise on stray reads. The new UHF Portal Plus combines the reading performances of a cabin with the ease of operation of a portal. Thanks to its capability to filter stray reads, Datamars UHF Portal Plus can be used to read carts packed with clean stacks of textiles. The UHF Portal Plus can read up to 500 pieces at regular walking speed. It is the perfect solution to read a large number of textiles on the clean side but can also be used in any area were bulk reading is needed without slowing down the textile flow. For more information about this product, download the datasheet here. The new UHF Open Tunnel has been designed to work on virtually any laundry conveyor belt. It’s the perfect reading system to read clean pack of textiles. As the tunnel is completely opened it doesn’t interfere with the flow of textiles and its operation is transparent to the laundry process. Stray reads are filtered out by software algorithms. The tunnel also automatically adapts to different conveyor speeds. Built from lightweight aluminium and stainless steel, it resists the harshest laundry environments. For more information about this product, download the datasheet here. Datamars this year also drastically improved its UHF Cabinets reading speed, halving the time required by previous generation Datamars UHF systems. Now Datamars UHF cabinets take just 3.5 seconds on average to read a trolley containing 1’000 items and, in a laundry using the cabinet at full speed, that’s an amazing gain of almost 1 hour per shift. Thanks to these strategical launches, Datamars reading systems portfolio can be now considered the widest of the market and encompasses different product categories to meet any customer need: portals (fast and reliable they are perfect to bulk scanning on both the soil and clean side), cabinets (to read 1000s of textiles in a few seconds with an unsurpassed level of accuracy), tunnels (to read stack of textiles after folding), conveyor systems (to read hanging garments), table tops and combo systems UHF-HF-LF to support customers transitioning to newer technologies. “Last year we released the FT401, our smallest UHF Laundry Chip ever, with the goal of making the tag completely unnoticeable when placed inside the textile. We are following the same approach with reading systems that we design so they can be smoothly integrated into the work flow, without interfering with the laundry process. We aim to make the technology as ‘invisible’ as possible to the user.” says Julien Buros, Product and Services Director at Datamars Textile ID. “We know laundries work on a very tight schedule in which every second counts. A few months ago we announced the fastest UHF cabin which can read up to 1’000 tags in just 3.5 seconds. We are now going one step further with the release of the ‘In Motion’ reading systems that are able to accurately scan moving trolleys or stack of textiles.”.